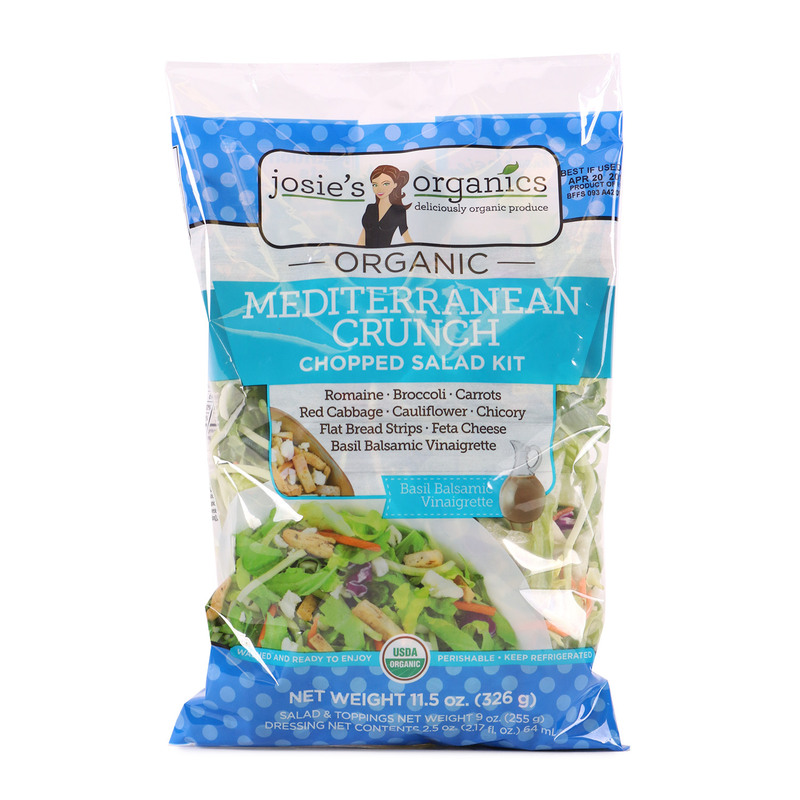 The Mediterranean Crunch Chopped Salad is veggie-filled and so fresh! 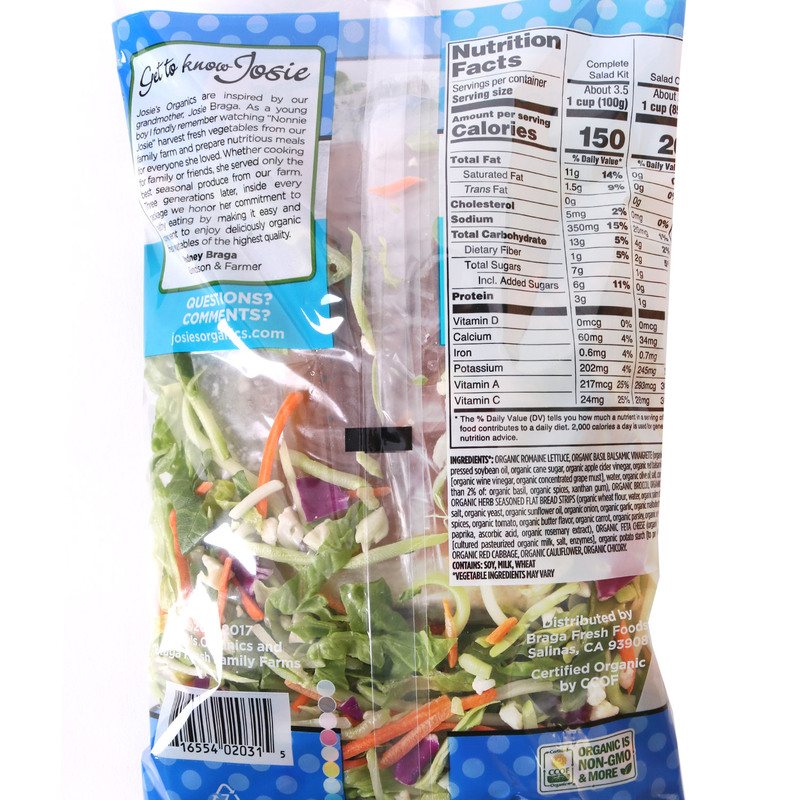 Romaine, broccoli, carrots, red cabbage, cauliflower, and chicory make the perfect salad combination. The flat bread strips offer a crunch, while the feta cheese adds a creamy flavor! The basil balsamic vinaigrette brings every flavor together making it an easy lunch on a busy day, or a tasty mix to wrap in a pita! Organic romaine lettuce, organic basil balsamic vinaigrette (organic expeller pressed soybean oil, organic cane sugar, organic apple cider vinegar, organic red balsamic vinegar [organic wine vinegar, organic concentrated grape must], water, organic olive oil, salt, contains less than 2% of: organic basil, organic spices, xanthan gum), organic broccoli, organic carrot, organic herb seasoned flat bread strips (organic wheat flour, water, organic palm shortening, salt, organic yeast, organic sunflower oil, organic onion, organic garlic, organic maltodextrin, organic spices, organic tomato, organic butter flavor, organic carrot, organic parsley, organic celery, organic paprika, ascorbic acid, organic rosemary extract), organic feta cheese (organic feta cheese [cultured pasteurized organic milk, salt, enzymes], organic potato starch [to prevent caking]), organic red cabbage, organic cauliflower, organic chicory.